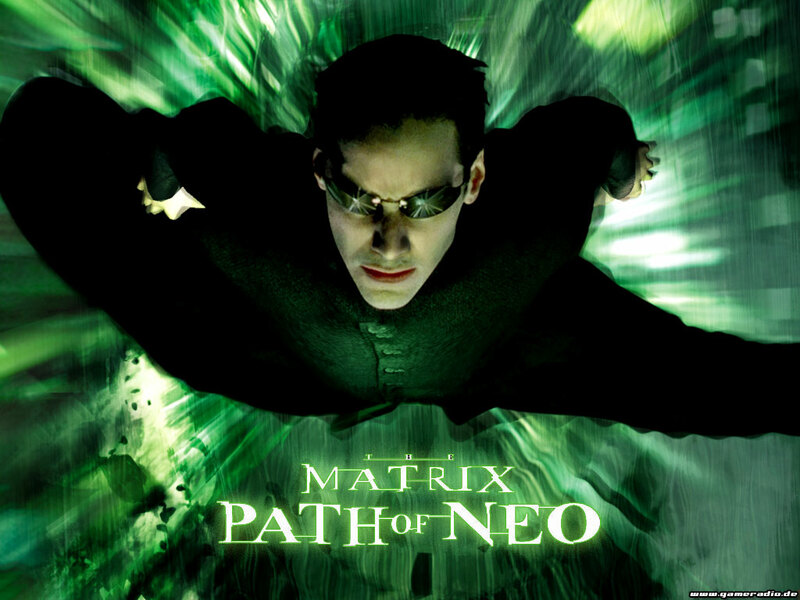 The Matrix, Path of Neo, November 4, 2014. (http://comicvine.com). I’ve never really had much patience for technical academic jargon, even in my wide-eyed grad school days twenty years ago. And my patience for terms like post-structuralism, post-modern, neo-Marxist and eschatological has grown government-paper-stock-thin as I’ve approached middle-age. Lately, terms like neoliberal and neoconservative have found their way into my sniper sights, especially with the ’14 midterm elections upon us. These terms may have meant something very separate and distinctive fifty or sixty years ago, but they darn sure don’t now. Except, maybe, to academicians and the elite literati, people who somehow believe that these terms are as useful as food, drink and water. It wasn’t until grad school at the University of Pittsburgh when I became aware of these terms. Back then, I saw neoliberal or neoliberalism in everything I read about race and economic concerns. Whether it was about Robert Fogel and Stanley Engerman’s ridiculous statistical depiction of slavery in Time on the Cross (1974), or Arthur Schlesinger, Jr.’s work on twentieth-century political shifts in his Cycles of American History (1986), they and the reviewers of their books used the term neoliberal like it was parsley for making pesto. Neoconservative hasn’t been around as long, a term about a decade younger than it’s post-World War II counterpart. It’s definition has evaded most academicians and the vast majority of lay-folk over the last half-century. Sometimes it’s used interchangeably with conservative or politically conservative, sometimes it’s used in the same sentence as right-wing or the religious right or evangelicals. 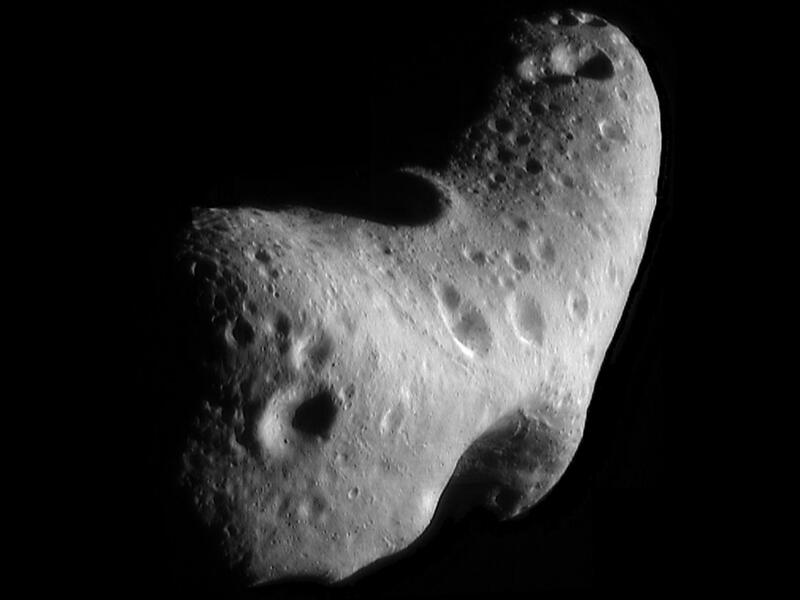 Asteroid Eros, a near-Earth object, or NEO, June 16, 2014. (http://jpl.nasa.gov). In public domain. Though it’s definition is elusive, it’s history isn’t. Barry Goldwater’s gigantic loss to President Lyndon Baines Johnson in the ’64 Presidential Election led to a host of disaffected Democrats, old-money Republicans and other political misfits getting together and hatching a plan to dismantle the Democratic Party’s New Deal coalition. They took advantage of the racism and roiling, boiling resentment of Southern Democrats — Dixiecrats, really — toward their party, the federal government and its growing support for Blacks and civil rights. They also took advantage of wealthy Republicans and the ages-old cry of corporations desperate for lower taxes and ever-higher profit margins. All of this came together in Richard Nixon’s ’68 presidential campaign with the Southern Strategy, turning Southern voters from Democrat to Republican. Not to mention with LBJ and Vietnam, the so-called Silent Majority, and their resentment toward rebellious, privileged college students and protestors. We know it all worked, because fifty years later, to talk of the South as a Democratic bloc today is almost as ludicrous as it was to talk about the South as being ripe for a Republican takeover in ’64. Beyond that, though, with the inclusion of evangelical Christians and other religious and social conservatives came the inclusion of traditional conservatism, neoconservatism, and neoliberalism in the Republican Party, the Democratic Party, and in the US’ cultural mainstream by the late-1980s. By then, these terms neoliberal and neoconservative had lost their original meaning, if they were really that different in meaning to begin with. The Republicans had married the terms and allowed the coupling to have kids and then grandkids with names like smaller government, deregulation, lower taxes for the wealthy (so-called “job creators”) and for corporations, prison-industrial complex, ending abortion, welfare reform, education reform, and voter disenfranchisement. This combination of war hawks, an unfettered version of free-market capitalism, with low government regulation and taxes on the rich and corporation, combined with high government regulation of nonconformist activities and peoples (people of color, LGBT marriage rights, women’s reproductive rights, everyone who isn’t Christian or Christian-sounding)? I don’t understand why we don’t call it what it really is. 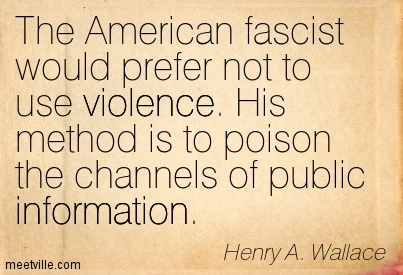 Quote from Henry A. Wallace, Vice-President of the United States, 1944. (http://meetville.com). Ladies and gentlemen and transgender, what we have in the US today — and have had in increasing measure for more than four decades — is a mild form of fascism, plain and simple. Yes, you can still vote, but the process is rigged from start to finish by greed and corruption and legal barriers to benefit the rich, the greedy and the corrupt. Yes, we have representation, through gerrymandered districts and hundreds of candidates with lined pockets running unopposed. Yes, we still have a Congress, a group who has done nothing to support ordinary Americans without also benefiting the top 1% in more than thirty years. A group who, in recent years, has done next to nothing at all other than raise more money to run for reelection in the past four years. As for the presidency, despite Congress’ control of the purse strings, every president since FDR’s third term has found a way to increase their political power, even as their influence on the legislative branch has decreased. With all this, I have no use for the terms neoliberal and neoconservative. Not when all roads have led us to oligarchy, plutocracy and fascism. 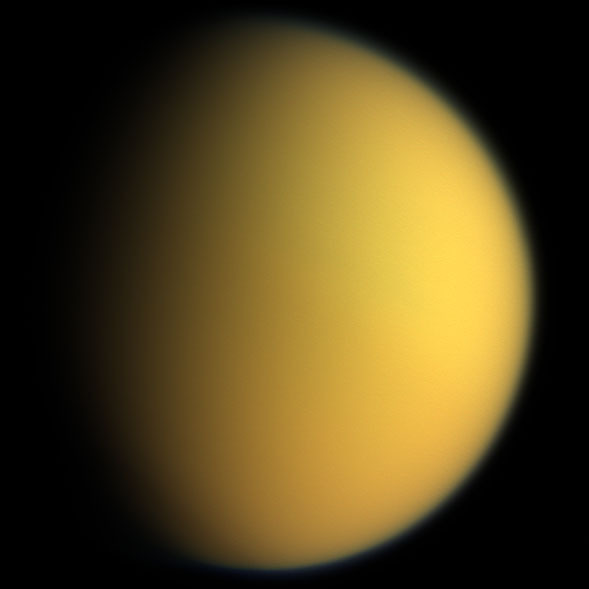 Titan in natural color, Cassini spacecraft, April 16, 2005. (Source/http://photojournal.jpl.nasa.gov/catalog/PIA06230) - In public domain. With the passage of the debt ceiling/budget cuts deal that Rep. Emanuel Cleaver (D-MO) called a “a sugar-coated Satan sandwich” on Monday, it became clear that conservative politicians are only patriotic when they can make money off of misery. We know that the conservative/reactionary/Tea Party agenda is to ensure that the legacy of the New Deal and liberal America is as charred as the dinosaurs were 65 million years ago. And with it, our futures and the future of kids like my eight-year-old son. But how will we get to a future with no future, you ask? How will this capitulation — oops, I mean compromise — between President Obama, House Speaker John Boehner and Senate Minority Leader Mitch McConnell lead us into the event horizon of a black hole? It will be because the reactionary Republicans and the diffident Democrats will make one big effort to save the US and world economy, to create jobs and wealth. All while breaking treaties, threatening world peace and destroying the environment in the process. Forget about “drill, baby, drill” and the ANWR (Arctic National Wildlife Refuge) issue. Think bigger. Think fictitiously big. Think Saturn’s biggest moon, Titan. It’s not only the second largest moon in the solar system (after Jupiter’s largest moon Ganymede), and double the size of Earth’s moon. It’s the only moon in the solar system with a dense atmosphere, about ten times as dense as our own. It also has a huge reservoir of organic molecules and hydrocarbons in its atmosphere, and liquid methane and ethane all over its surface, at least as verified via the Cassini spacecraft and its unmanned fly-bys since 2004. Some scientists believe that there’s enough liquid methane and other hydrocarbons under and on the surface and in the atmosphere to power the current world economy for the next fifty million years. 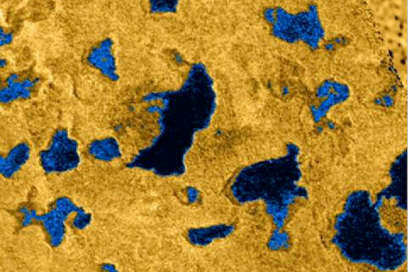 Land of liquid methane lakes, as radar mapped with false color mosaic, North Polar Region, Titan, October 11, 2007. (Source/ http://photojournal.jpl.nasa.gov/catalog/?IDNumber=PIA10008) - In public domain. Because many of our fearless conservative leaders don’t believe in global warming/climate change — but do believe in making money — they would see the recent discovery of the stuff on Titan not as a place to explore the possibility of life. Instead, it would be a grand opportunity to solve the world’s energy crisis. Of course, they’d have to admit that there is such a thing as peak oil, and then have ample evidence that the world has reached peak production to boot. So, say it’s 2014, and everyone from OPEC to the UN to Exxon Mobil has reported that we’ve reached the outer edge of peak oil. If the neo-con/Tea Party types are still in control of the House of Representatives, or worse, in control of the Senate and the White House, there wouldn’t even be a debate. They’d put together a bill to push through a $100 billion package for NASA to work with Exxon Mobil, Shell and Halliburton in sending a team of scientists, petrochemical engineers and drillers to figure out how to pump Titan’s frigid air and hydrocarbon lakes into massive tanks to return to Earth for our consumption. The companies would have to match the $100 billion package dollar for dollar, which they would do, of course. If Obama’s in his second term with a divided government, though there would be more protests from environmental groups, climatologists, and grassroots organizations than even with a President Mitt Romney, it wouldn’t matter. With the promise of as many as five million new jobs in three years, and 150,000 jobs to support the Titan “Oil” Pumping mission within the first six months, the majority of anxious Americans would endorse this plan. Obama would talk about “honoring America’s commitments” to space as exploration. He’d complain about the need to protect the Earth from even more disastrous and accelerated climate change, not to mention the wasting of financial and scientific resources that could leave Titan a moon-sized example of an EPA Superfund site if the mission somehow set the moon’s atmosphere on fire. Obama would even bring up green alternatives for using the Sun and solar system to supply the world’s energy needs. Then he’d fold like a warped desk of cards. This would violate the Outer Space Treaty, signed by the United States, the former Soviet Union and the United Kingdom in 1967, and by half of the countries of the world in the forty-four years since. Not only are we not suppose to have nuclear weapons in space, the more immediate intent of the treaty, but we’re also prohibited from claiming any part of outer space as an individual nation, as they are the “common heritage of mankind.” The act to drain Titan as a petrochemical resource unilaterally would break the treaty, and leave other space-faring nations into a new and potentially dangerous space race. So, whether Obama or a semi-fictitious Republican president, the world would compromise with the US government, allowing this cockamamie scheme to move forward without the threat of war if they could receive a twenty-five percent share in whatever hydrocarbons are recovered from Titan. In exchange, a new treaty is signed promising a thirty percent reduction in fossil fuel consumption by 2040, made up for by a twenty percent increase in green energy over the same quarter-century. 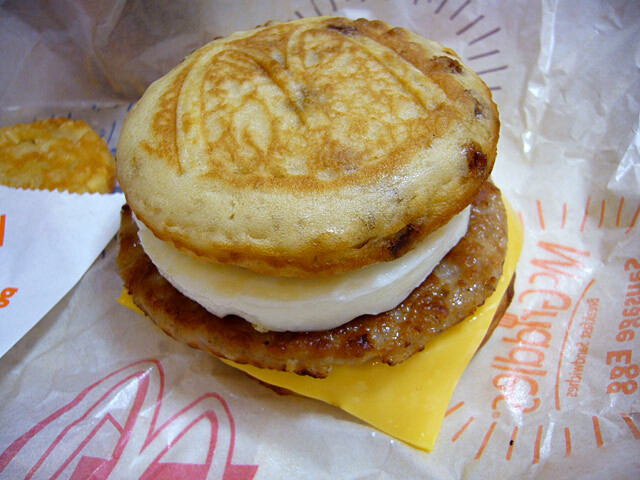 McDonald's McGriddle breakfast sandwich, the ultimate Satan sandwich, at 420 calories, September 27, 2006. (Source/ http://www.flickr.com/photos/u-suke/253343509/Yusuke Kawasaki). In public domain under the terms of the cc-by-2.0. All a great idea. The ultimate Satan sandwich, because if such a mission to Titan succeeds, the new Kyoto Accords wouldn’t mean a damn thing. We’ll be burning methane until we all have to buy oxygen tanks in order to breathe. Though this is a fictitious scenario, it’s based on a reality that has been unfolding in our country for decades. The unfortunate truth is, between the lustful servants of money and corporations and capitulating national leadership, this Satan-sandwich-story is more of a possibility than us seeing a human being walk on Mars. At least in my lifetime.